Steven (Chicagoland, United States) on 22 August 2017 in Plant & Nature and Portfolio. Photo captured August 6, 2017. Quelle belle couleur pour cette fleur d'hibiscus . 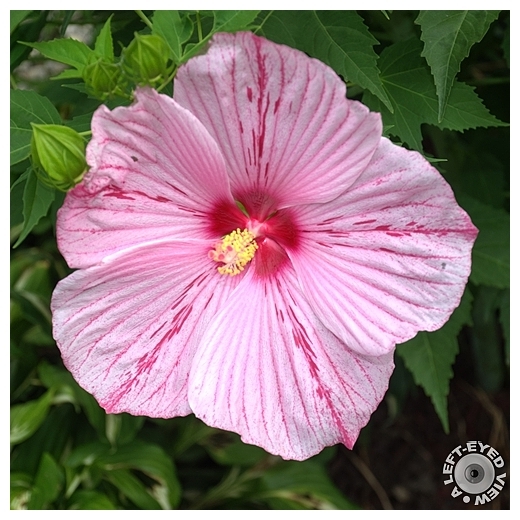 Beautiful capture of the pink hibiscus ! Superb image of the Hibiscus. A great plant for any garden. Son nom est original ! Elle est magnifique ! A wonderful close up of this beautiful blossom. I too like the name very much. Beautiful flower of hibiscus ...! What a treat! I've not seen these colors on an hibiscus before. Once again, a beautiful photo. What a great name for a flower! And the color is perfect! This is a gorgeous flower! It is amazing that colours like these can be created. Beautiful. I have seen red hibiscus (just solid red) with variegated leaves (white & green or white, red & green) in Malaysia.